Create animated GIF files online for your photos with Gickr. This service allows you to upload your photos and you can make it as GIF files. >You can choose your own sizes. >You can set up the speed of GIF file. 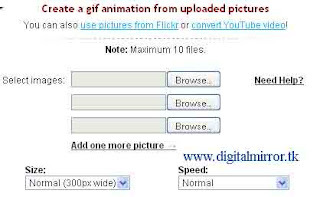 >Easy to create GIF files by uploading pictures. >You can upload Maximum of 10 files.